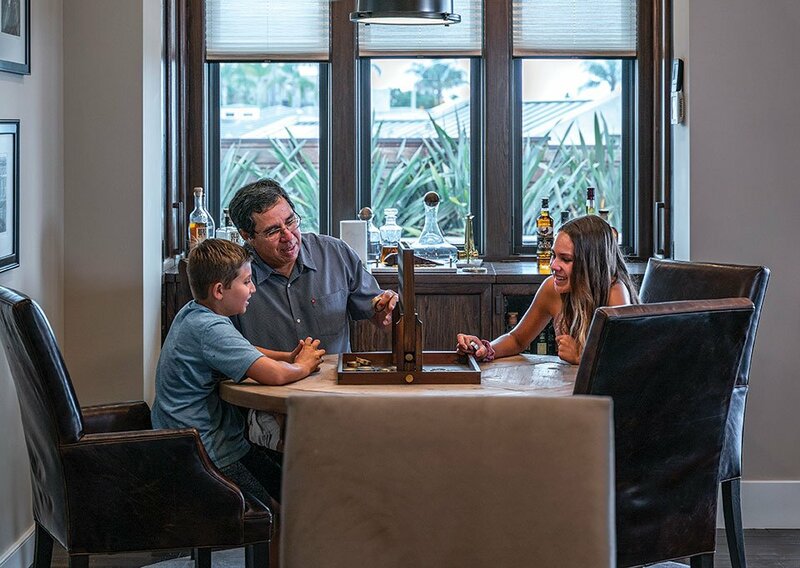 Rich Cardenas kept his family in mind when he updated his home. The coffee table hosts a friendly Scrabble game with Rich and his kids. 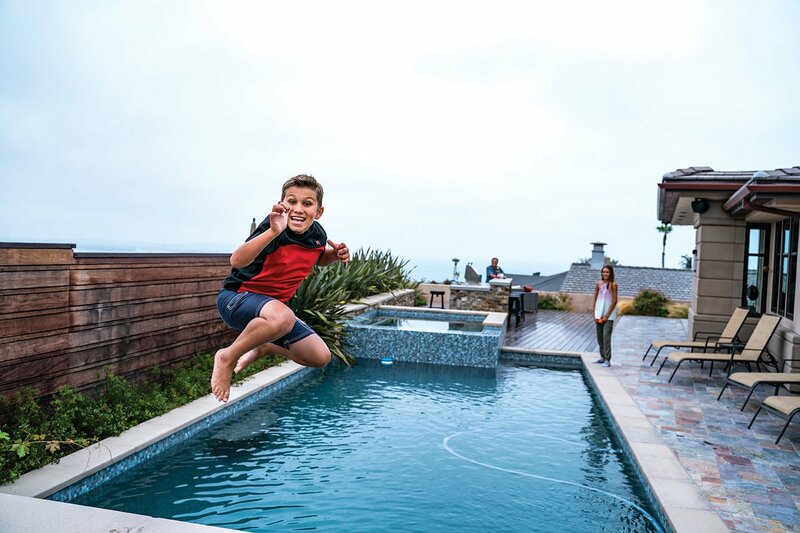 When Rich Cardenas vacated his La Jolla house and moved everything out for a complete do-over, his kids, Emmy (now 13), and Andrew (now 11) were nervous. They had recently gone through a big change when their parents amicably divorced. Even though joint custody was a done deal and their second home with mom was just a mile down the street, Dad’s house was the place they’d lived all their lives. With a makeover in the works, Emmy and Andrew were scared that it would be a different house. But Rich, whose role as dad takes top priority, knew how to quell their fears. The team for the makeover was a slam dunk: Lisa Franco, another close neighbor and good friend, happened to be an interior designer. Mark Morris of Oasis Architecture and Design often works together with Lisa, and Rich had met him years ago during Lisa’s own home renovation. The architect converted the house to focus on the view. A wood-burning fireplace hides a TV behind hand-forged steel cabinets. Pushing and taking out walls and demolishing a fireplace between two rooms, created a big, open space that serves as a kitchen/family room with floor-to-ceiling-around-the-corner sliding glass doors showing off the magnificence of a panoramic seascape and leading to the outdoor living area with its barbecue, spa and pool. 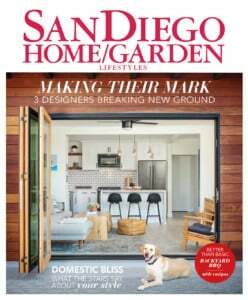 The coastal family-friendly remodel’s outdoor living area is a hit. A balance of exterior and interior rustic and modern elements—rich woods, natural stone and hand-forged metals—almost seem to echo Rich’s contrasting character traits—a down-to-earth ruggedness that melds with high-tech math wizardry. And the scale of materials that make sense for this high-ceilinged home also make sense for Rich’s tall, broad-shouldered stature. Even the 9-foot entry door is magnificently grand compared to the typical 7-foot door. 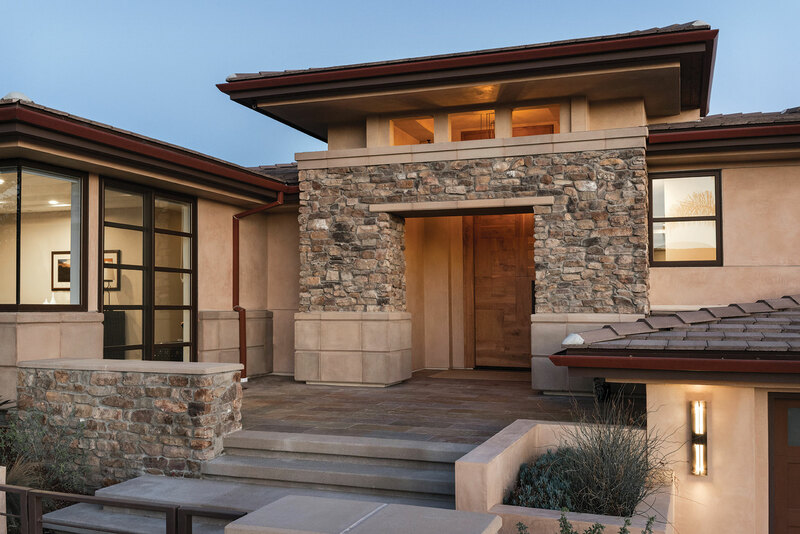 Stone at the front exterior adds presence while recessing the door, providing an inviting sense of entry without overwhelming the property. Photo: Auda & Coudayre. A double-sided art installation, which can be switched out depending on the season, greets visitors when they walk in and also adds interest to the dining room on the other side of the entry. 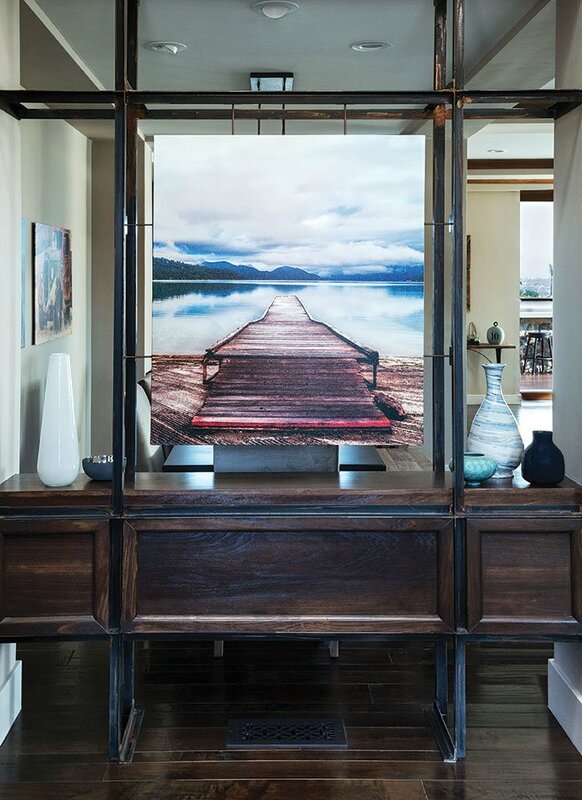 The art hangs from a specially made furniture piece that serves as a room divider between the entry and dining room, and as a buffet for the dining room. To the left of the entry, a home office does double duty as a guest room. 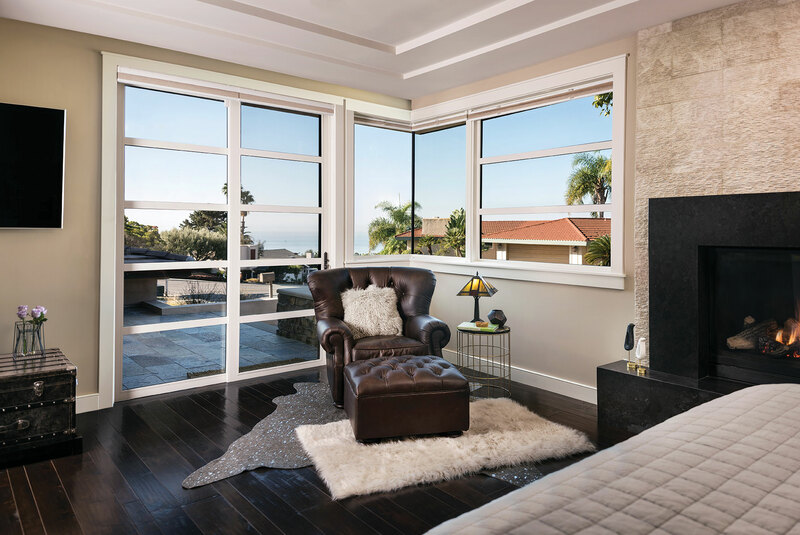 Just beyond, live the kids’ rooms, each with their own bathrooms (although, says Rich, they spend a lot of time in the master bathroom because they love its stand-alone, sculptural tub); and the master bedroom with ocean views and a cozy, leather chair next to a fireplace. 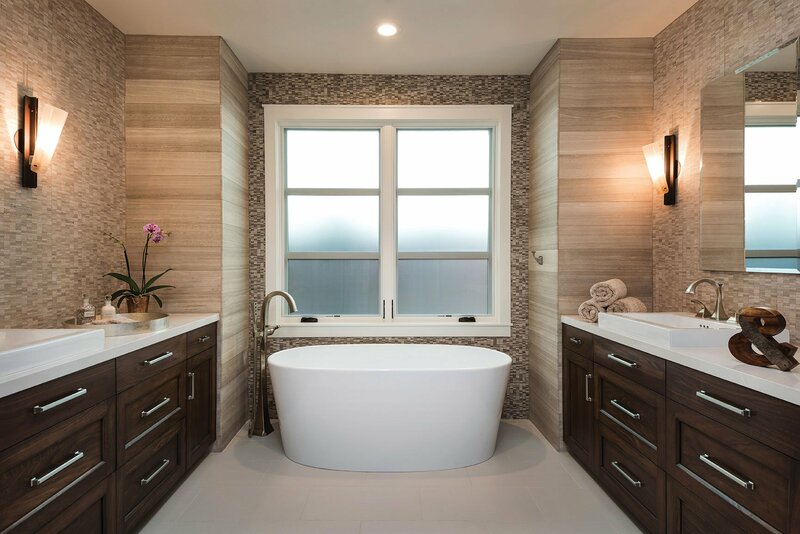 A sculptural tub, sconces and white countertops offset the master bathroom’s darker tones. Photo: Auda & Coudayre. Layered rugs and a hefty leather chair with nailhead finishes cozy up the master bedroom. Photo: Auda & Coudayre. 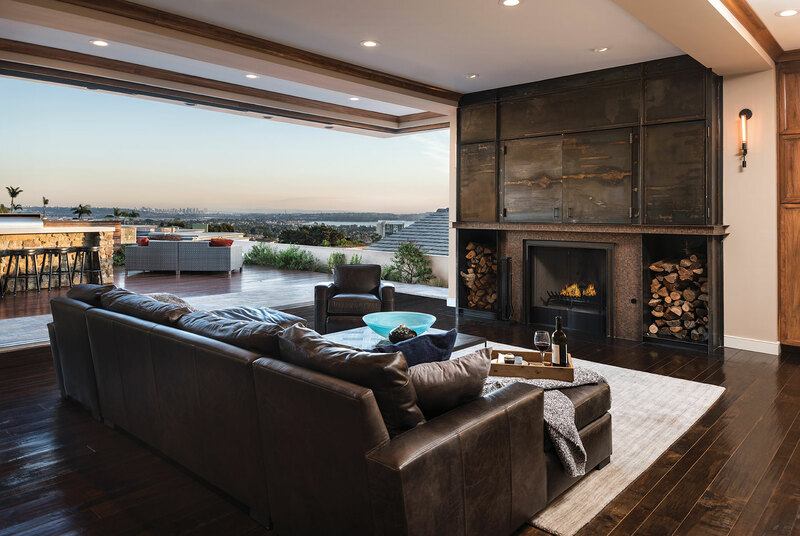 Another great place to sit is, of course, the indoor-to-outdoor great room where a deep leather couch faces an unusual fireplace that is an artwork in itself. Wood, steel and copper are integral parts of the home’s design. The entry’s front door and hand-forged room divider containing angled iron-steel announce the natural materials within from the get-go. Lisa even found barstools with wood and metal bases for the island in the kitchen, now open to the living area. 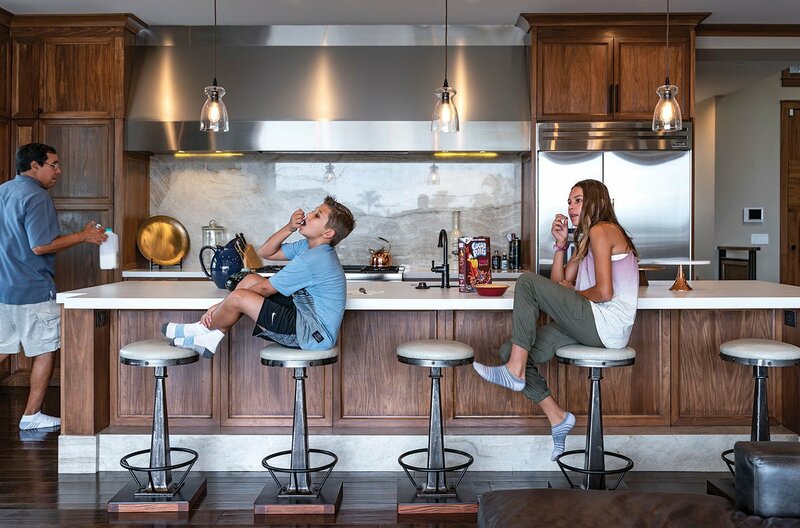 Rich’s kids relax with breakfast at the kitchen island. The kitchen’s lighter tones balance the heavier woods and darker colors elsewhere. An early idea for a scotch lounge morphed into a family-friendly game room-scotch area as the remodel progressed. Photo: Auda & Coudayre. Rich enjoys cooking—“I’m a good, open-the-fridge-and-I-can-figure-something-out kind of cook,” he says—but collecting scotch one-ups cooking (probably by a long shot). 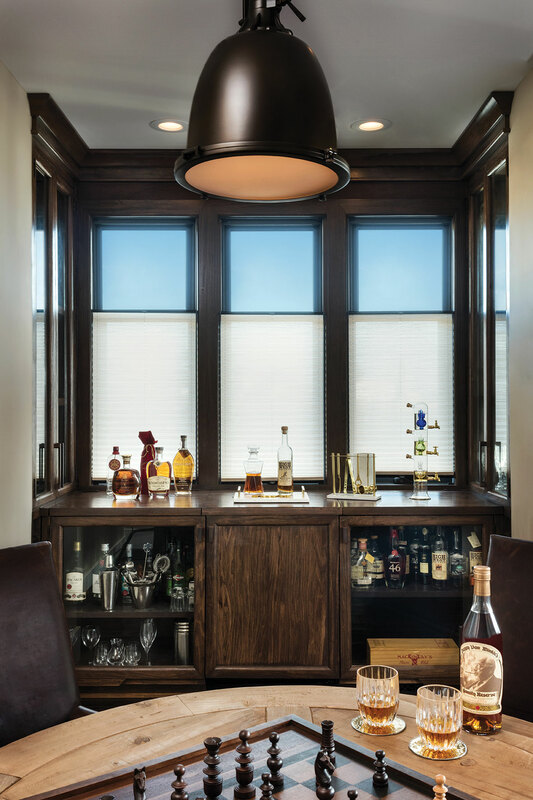 Displaying his scotch bottles in the kitchen wasn’t ideal, so the plan to create a scotch lounge, across from the dining nook and on the other side of the living area, was born. And neither was the idea. As Rich points out, “I’m not a bachelor. I’m a dad.” So, when they went back to the drawing board, they turned the space into a game room-scotch area. 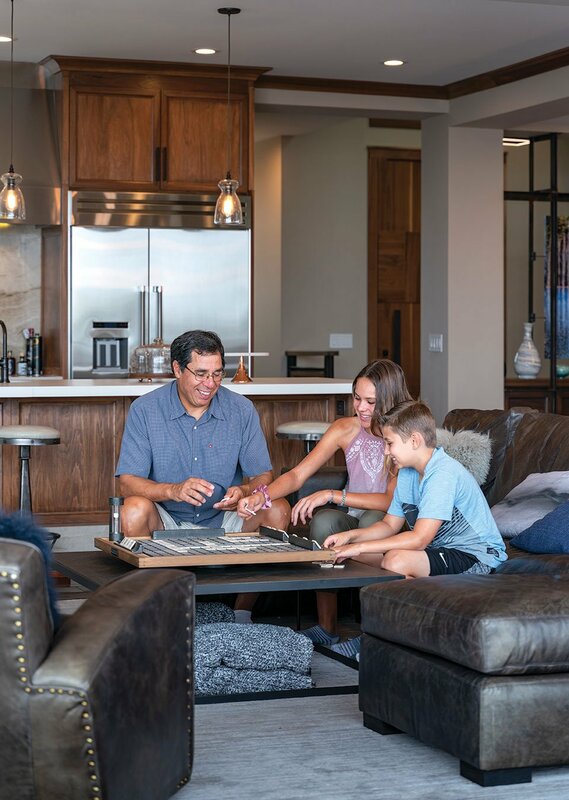 There’s a big table where the family can play Scrabble together, or the kids can build something with Legos, or Rich can open up a nice bottle from his collection and share it with friends. On the table’s other side, glassed-in cabinetry showcases his collection. The space ended up being a win-win for dad and kids. As did the house. Emmy and Andrew feel comfy in their “new” home. They now know dad was right when he told them, “We brought the house forward and the house is happy.” Just like the people in it. No fair! Looks like dad is giving Andrew hints on how to beat Emmy at Connect 4.